Shadow the Hedgehog[a] is a 2005 platform game developed by Sega Studios USA, the former United States division of Sonic Team, and published by Sega. It is a spin-off from the Sonic the Hedgehog series and follows Shadow the Hedgehog, a creation of Doctor Eggman's grandfather, Professor Gerald Robotnik, as he attempts to learn about his past while suffering from amnesia. Shadow the Hedgehog introduces third-person shooter elements and nonlinear gameplay to the Sonic franchise. To defeat enemies, Shadow can use various weapons and special attacks, and most levels have three possible missions that the player may choose to complete. The missions completed determine the game's plot and subsequently playable levels. The development team wanted to make a game featuring Shadow to capitalize on the character's popularity and resolve plot mysteries that began with his introduction in Sonic Adventure 2. Director Takashi Iizuka, who targeted a younger audience with previous Sonic games, strove to attract an older audience with Shadow the Hedgehog; Shadow's darker character also allowed the team to use elements otherwise inappropriate for the series. The game was revealed at the March 2005 Walk of Game event, and was released for the GameCube, PlayStation 2, and Xbox in November 2005. Shadow the Hedgehog received generally unfavorable reviews from critics, who disliked its controls, plot, and dark themes, and took particular issue with the addition of guns and other weapons to traditional Sonic gameplay. However, some praised its replay value and it went on to become a commercial success, selling 2.06 million copies by March 2007. Shadow the Hedgehog is a platform game that incorporates elements of action-adventure gameplay. Like previous games in the Sonic series, basic gameplay involves running quickly, collecting rings, and destroying enemies. Shadow collects rings as a form of health; when he is attacked by an enemy, ten of his rings bounce away from him in all directions. If he is hit by an enemy while not having any rings, he loses a life. Each level is completed by undertaking a mission, and each mission is labeled "Hero," "Dark," or "Normal." The "Hero" missions involve completing tasks for the Sonic series' heroic characters, or Doctor Eggman on one occasion, and the "Dark" missions involve completing tasks for the Black Arms or Doctor Eggman. The "Normal" missions involve reaching the Chaos Emerald or goal at the end of the level. Examples of non-neutral mission objectives include killing all enemies in the levels, destroying an aircraft flying to the end of the level, or activating or destroying objects in the level. All enemies attack Shadow regardless of the mission chosen. The mission types selected affect the plot, the levels played, and the ending received out of ten possibilities. Each level features cutscenes that advance the story, and several levels also feature boss battles. There are 326 possible paths to take in Shadow the Hedgehog, and each pathway is individually named. Shadow uses a submachine gun to shoot a G.U.N. soldier. The game's violent theme and mechanics were two major areas of criticism. New gameplay features distinguish Shadow the Hedgehog from previous Sonic games. For example, Shadow can use guns to combat enemies, adding an element of third-person shooter gameplay. Parts of the scenery, such as traffic signs, can also be used as weapons. Another new feature is the ability to drive vehicles, such as motorcycles and alien aircraft. Although Shadow can outrun the game's vehicles, the latter have unique capabilities, such as crushing enemies and traversing otherwise impassible acid-covered areas. As in most Sonic series games, the Chaos Emeralds play a major role; they help Shadow remember his past and allow him to perform Chaos Control and Chaos Blast. Chaos Control allows Shadow to move more quickly in levels and slows time in boss battles, and Chaos Blast creates an explosion that destroys or severely damages all nearby enemies. Shadow can perform Chaos Control after the player fills the Hero Gauge by defeating Black Arms soldiers, and he can perform Chaos Blast after filling the Dark Gauge by defeating G.U.N. soldiers. The game includes a two-player mode that retains the single-player mechanics but is set in one of three specially designed stages and uses a vertically split screen to separate each player's view. Each player chooses one of the available characters—Shadow, two metallic versions of him, and palette-swapped variants of each. The combatants attack each other and steal each other's rings until all but one are eliminated. Additionally, in single-player mode, a second player may take control of Shadow's sidekick character in some stages. The several stages in Shadow the Hedgehog. Each of the stages represents a different alignment. Shadow the Hedgehog, the game's titular protagonist, was created 50 years before the game's events by Professor Gerald Robotnik in an orbital military research space colony known as the ARK. Robotnik was trying to unlock the secrets of eternal life on the government's orders and create the "Ultimate Life Form." To that end, Robotnik designed Shadow to harness the powers of the Chaos Emeralds. At the end of Sonic Adventure 2, his first in-game appearance, Shadow was presumed dead, but he returned in Sonic Heroes with amnesia that persists into the events of Shadow the Hedgehog. The Guardian Units of Nations (G.U.N.) is the military of Earth's government, the United Federation, and it is directed by the G.U.N. Commander. When completing "Hero" missions, Shadow usually helps G.U.N. and heroic characters from the Sonic series, including Sonic, Tails, Knuckles, Amy, Rouge, Omega, Vector, Charmy, and Espio. Their aim is to protect Earth from both Doctor Eggman and the Black Arms, an army of various related alien species that invade Earth from the Black Comet. Black Doom, the leader of the Black Arms, sends an extension of himself called "Doom's Eye" to watch Shadow and help him complete missions. When completing "Dark" missions, Shadow helps either Black Doom or Doctor Eggman, each of whom wants the Chaos Emeralds for himself. In one "Hero" mission of Sky Troops, Shadow assists Doctor Eggman in battling the Black Arms. Completing "Hero," "Dark," or "Normal" missions determines which levels are subsequently playable. Each white box represents a level, and each red or blue box represents a boss mission at the end of the game. The colored lines that connect levels show how the completion of certain missions affects the storyline. At the beginning of the game, Shadow suffers from amnesia. Other than the events of Sonic Heroes that took place three months prior, Shadow remembers only two things: his name and his attempt to escape the space colony ARK with his creator's granddaughter Maria, who was killed by G.U.N. soldiers. Having walked through a room filled with androids that looked like him during the events of Sonic Heroes, Shadow wonders if he too is an android. The game starts with Shadow reminiscing outside the city of Westopolis when the alien race Black Arms drops out of the sky and invades the city. One Black Arms alien, Doom's Eye, approaches Shadow, and the Black Arms's leader Black Doom tells Shadow of an old agreement Shadow made: to bring Black Doom the Chaos Emeralds. Stunned that Black Doom knew his name, Shadow searches for the Chaos Emeralds to learn about his past. The game progresses through the Westopolis level and five more levels from the different paths Shadow may take. As missions are completed, Shadow learns more about his past and regains memories. He can choose to help Doctor Eggman or the Black Arms, to help G.U.N. and the series' heroic characters, or to help neither and keep the Chaos Emeralds for himself. The missions completed determine which one of ten possible endings will be seen after Shadow collects all the Chaos Emeralds and defeats one of the game's final bosses. The possible ending events range from planning to defeat the Black Arms to planning to destroy the planet. Completing all ten endings unlocks the game's true ending in which Black Doom uses Chaos Control, enhanced by the power of all seven Chaos Emeralds, to bring the Black Comet to the Earth's surface. Black Doom explains that the Black Arms intend to use humans as an energy source, and the Black Comet begins to release a nerve gas into the Earth's atmosphere that causes total paralysis in those who inhale it. Shadow confronts Black Doom after the "Last Way" level, where he discovers that Professor Gerald Robotnik created the ARK's Eclipse Cannon weapon to destroy the Black Comet. During their confrontation, Black Doom reveals that Shadow was created using Black Doom's blood, and he attempts to use mind control on Shadow, but fails. Black Doom then transforms into a giant called Devil Doom; in response, Shadow uses the Chaos Emeralds to transform into Super Shadow and confronts Devil Doom. During the battle, Doctor Eggman confirms to Shadow that he is the original and not an android. Shadow defeats Devil Doom and uses Chaos Control to teleport the Black Comet back into Earth's orbit, where he obliterates it using the Eclipse Cannon. His friends are elated, as are people at G.U.N. headquarters. Shadow is then shown in the ARK's control room holding up a photograph of Maria and Gerald. He discards the photograph and leaves the room, deciding to put the past behind him and move on. "Shadow the Hedgehog has a much darker personality than Sonic the Hedgehog. In Sonic the Hedgehog, your typical mission was to go out and beat the bad guys, it gives the players a choice to either take the side of the good hero guys or to take the side of the bad buys [sic], giving the player the option to choose in the game." Shadow the Hedgehog was developed by Sega Studios USA, the now-defunct United States division of Sega's Sonic Team, and published by Sega. Sega first revealed the game and its tagline ("Hero or villain? You decide.") at the March 8, 2005 inauguration of Sonic the Hedgehog into the Walk of Game. Sega formally announced development of the game for the Nintendo GameCube, PlayStation 2, and Xbox video game consoles on March 23, 2005. The same year, Sega released the game in North America on November 15, in Europe on November 18, and in Japan on December 15. Sonic Team's Takashi Iizuka, who had worked on the Sonic the Hedgehog series since 1993, targeted a younger audience with previous Sonic games and wanted to attract an older audience with Shadow the Hedgehog. The game's development team wanted to make a game featuring Shadow to resolve plot mysteries that began with the character's introduction in Sonic Adventure 2. The team felt that Shadow's design—inspired by films such as Underworld, Constantine, and the Terminator series—would make the story darker and allow for elements, such as vehicles and weapons, otherwise considered inappropriate for a Sonic game. Sonic Team's Yuji Naka stated in an interview with GameSpy that he wanted to use Shadow as the game's main character due to his popularity among fans and being the best fit for a "gun action" game. The game features several CG-animated cutscenes produced by Blur Studio. The game also contains profanities, including instances of damn and hell spoken by Shadow and other characters such as Espio, the G.U.N. Commander, Knuckles, and Sonic. Profanity and the use of guns, both firsts for the Sonic series, generated pre-release controversy. The ESRB assigned the game a rating of E10+ for "fantasy violence" and "mild language". The music of Shadow the Hedgehog was composed by Jun Senoue, Yutaka Minobe, Tomoya Ohtani, and Mariko Nanba. Lost and Found: Shadow the Hedgehog Vocal Trax is a video game soundtrack album released on CD on February 22, 2006. The album contains seven vocal songs from the game, one of which is a remix rather than the original. 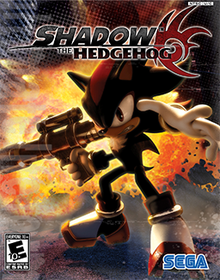 Another soundtrack, Shadow the Hedgehog: Original Soundtrax, was also released on February 22, 2006. It contains both vocal and instrumental tracks from the game. The game was the first in the Sonic series to use the 4Kids cast from Sonic X following the death of Doctor Eggman's previous voice actor, Deem Bristow. This cast continued to be used until late 2010 when all cast members except for Mike Pollock were replaced before the release of Sonic Free Riders. Shadow the Hedgehog received generally unfavorable reviews from critics, many of which were highly critical of its gameplay mechanics and differences from other Sonic games. However, it was voted the best game of 2005 in the Official Jetix Magazine Reader Awards and named the "Best Platformer" of 2005 by Nintendo Power readers (receiving more votes than the staff's choice, Sonic Rush). Shadow the Hedgehog was also a commercial success: Sega reported 1.59 million units sold from its release to March 2006 and 470,000 units sold in the U.S. from March 2006 to March 2007, for total sales of at least 2.06 million. The game was later released as a part of three budget lines: Greatest Hits and Platinum Range for the PlayStation 2 (representing sales of at least 400,000 in North America and Europe, respectively) and Player's Choice for the GameCube (250,000 in North America). Many critics derided the game's sense of maturity for a Sonic game, especially the addition of guns and other weapons. Game Informer staff writer Matt Helgeson said, "not only is this new 'adult' interpretation of Sonic painfully dumb, it’s also ill-advised and almost feels like a betrayal to longtime fans." Eurogamer staff writer Tom Bramwell felt that "the game's other selling point – its darker edge – [is] not really meant for us." G4's X-Play and GameSpy staff writer Patrick Klepek thought similarly. In contrast, Nintendo Power staff writer Steve Thomason rated the game 8.0 out of 10, stating, "this darker take on the Sonic universe succeeds for the most part, giving the series a bit of an edge without going overboard on violence." In addition, Official Xbox Magazine reassured readers, "Don't worry, Shadow the Hedgehog isn't half as 'urban' or quite as 'gangsta' as it first seems." Hegelson panned the game's "laughable" plot, saying it "makes no sense," and that various Sonic conventions undermined its attempts to be "mature" or "edgy". Reviewers also criticized the game's controls, especially Shadow's homing attack causing unexpected character deaths. Game Informer's Matt Helgeson complained that the attack "frequently sends you careening off into nothingness, resulting in cheap death after cheap death." Nintendo Power, X-Play, Eurogamer, Official Xbox Magazine, and GameSpy agreed. Other complaints focused on the mechanics of weapons and vehicles. Greg Mueller of GameSpot felt that the guns were nearly useless because of a lack of a target lock or manual aim, combined with an ineffective auto-aim. IGN staff writer Matt Casamassina, 1UP.com staff writer Greg Sewart, Game Informer, X-Play, GameSpy, and London's The Times also criticized the mechanics of Shadow's weapons, vehicles, and other aspects of the game's controls. However, Thomason said that "blasting Shadow's foes with the wide variety of weapons at his disposal is just plain fun." The level design received mixed comments. Mueller called some levels "extremely frustrating". Helgeson stated that the fast-paced "levels are poorly designed", and Andrew Reiner, who wrote a second-opinion review for Game Informer, called the level design "disastrous". Official Xbox Magazine was more mixed, balancing the possibility of getting lost in the large levels with the likely appeal of these stages to 3D Sonic gamers, particularly those who had enjoyed Sonic Heroes. GameTrailers found that "the levels are either dark and urban, or bright and psychedelic. Either way, they fit in well to the Sonic universe. They are loaded with speed ramps, loops and an assortment of other boosts that rocket Shadow like a pinball." Bettenhausen included "the classic run-like-hell roller coaster design philosophy" of some stages in his limited praise. Casamassina disliked the "stupid level design", saying that "[j]ust because they dazzled players six years ago does not mean that Sonic Team can copy and paste exactly the same loops and spins into each new franchise iteration and expect everyone to be happy with the outcome." GameSpy observed that "the areas are much less open than in previous Sonic games, but the level designers haven't taken advantage of the constraints." Nintendo Power singled out the difficulty of the missions that require the player to locate objects. Critics praised the game's replay value, applauding the many possible paths that a player may take through the game. GameTrailers stated, "this choose-your-own-adventure style gives the game replay value that many platformers lack." The Melbourne, Australia, publication Herald Sun, Nintendo Power, and Official Xbox Magazine thought similarly. GameSpot praised the variety of alternate endings, but concluded that "the gameplay isn't fun enough to warrant playing the game through multiple times." Bettenhausen thought that the morality system felt artificial, but said that it extended the game's replay value. ^ Japanese: シャドウ・ザ・ヘッジホッグ, Hepburn: Shadō za Hejjihoggu? ^ a b c d e f "Shadow the Hedgehog for PS2 Review". GameSpot. November 21, 2005. Archived from the original on 2 February 2009. Retrieved January 26, 2009. ^ a b c d Sewart, Greg (January 12, 2006). "Reviews: Shadow the Hedgehog for PS2". 1UP.com. Archived from the original on 15 November 2014. Retrieved January 26, 2009. ^ a b c d e f g h i "Shadow the Hedgehog - Review". GameTrailers. February 27, 2016 [November 16, 2005, later uploaded to YouTube]. Retrieved May 18, 2018. ^ a b c d e Castro, Juan (25 August 2005). "Shadow the Interview". IGN. Archived from the original on 6 April 2012. Retrieved 28 January 2009. ^ a b "Sonic the Hedgehog Character Profiles". GameSpot. October 14, 2005. Retrieved January 31, 2009. ^ Guess, Gerald (1 November 2005). "Shadow the Hedgehog: Prima Official Game Guide". Prima Games. Retrieved 15 March 2019 – via Google Books. ^ a b c d Deci, TJ. "Shadow the Hedgehog for GameCube Overview". Allgame. Archived from the original on 15 November 2014. Retrieved January 26, 2009. ^ a b c d e f g Mueller, Greg (November 21, 2005). "Shadow the Hedgehog for GameCube review". GameSpot. Retrieved June 25, 2014. ^ Guess, Gerald (1 November 2005). "Shadow the Hedgehog: Prima Official Game Guide". Prima Games. Retrieved 1 March 2019 – via Google Books. ^ a b Castaneda, Karl (September 7, 2005). "Nintendo World Report - GC Preview: Shadow the Hedgehog". Nintendo World Report. Retrieved February 4, 2009. ^ a b "IGN: Shadow the Hedgehog". IGN. Retrieved May 5, 2009. ^ "The Moral of the Story: Designing Moral Decisions in Games". www.gamasutra.com. Retrieved 1 March 2019. ^ a b c d e Pallesen, Lasse (March 23, 2004). "News Article: Sega Confirms Shadow the Hedgehog". Nintendo World Report. Retrieved January 28, 2009. ^ a b Sega Studio USA. Shadow the Hedgehog. Espio: Damn! We've been detected! ^ a b c "Game of the week; Shadow the Hedgehog; GameCube/PS2/Xbox (rrp $79.95) Rating: 3.5/5". Herald Sun (1): F02. February 26, 2006. ^ Sega Studio USA. Shadow the Hedgehog. Black Doom: Shadow... As you can see, the day of reckoning will soon be here. Find the seven Chaos Emeralds and bring them to me as promised. ^ Sega Studio USA. Shadow the Hedgehog. Shadow: If he says he knows the truth about who I am... then like it or not, I have to believe him. The only way I'm going to get the secrets to my past is to get those Chaos Emeralds! ^ Sega Studio USA. Shadow the Hedgehog. Shadow: Finally... I've got ALL the Chaos Emeralds! ^ Sega Studio USA. Shadow the Hedgehog. Shadow: With the power of these Emeralds, Black Doom and his army are finished! ^ a b Sega Studio USA. Shadow the Hedgehog. Shadow: With the power of these Emeralds, I'm going to destroy this damn planet! ^ Sega Studio USA. Shadow the Hedgehog. Black Doom: Humans are a great energy source for us... they will be well-kept. ^ Sega Studio USA. Shadow the Hedgehog. Black Doom: A special weapon... this gas, once released, is quickly absorbed into your bloodstream. In a moment, total paralysis will hit your nervous system. ^ Sega Studio USA. Shadow the Hedgehog. Black Doom: The end is near, now. Before long, the gas from this Comet will have spread over the entire planet. ^ Sega Studio USA. Shadow the Hedgehog. Gerald: Shadow...it's up to YOU and only YOU can stop them! I developed the Eclipse Cannon...it's the only weapon that can destroy that Black Comet. Shadow, you are the only hope... to save mankind as we know it. The future of this planet depends on...YOU! ^ Sega Studio USA. Shadow the Hedgehog. Black Doom: Don't you know? You were created from MY blood. ^ Sega Studio USA. Shadow the Hedgehog. Black Doom: Well, well, well...seems like you're immune to my mind control. ^ Sega Studio USA. Shadow the Hedgehog. Black Doom: Have it your way, Shadow. So be it...be prepared to meet your maker! Your past, present, and future ends here...TODAY! Prepare to die! Say goodbye Shadow as you witness my true wrath! ^ Sega Studio USA. Shadow the Hedgehog. Eggman: Shadow... can you hear me? This might be the last chance I have to speak to you so... what I said about having created you... it was all a lie... everyone thought you died during that horrible incident... but I rescued you with one of my robots... you lost your memory that's all... you really are the ultimate lifeform my grandfather created! ^ Sega Studio USA. Shadow the Hedgehog. Black Doom: Im...impossible! I am the supreme being that rules this universe! I am the immortal life form! I am the ultimate power! Gaaaah! / Shadow: This is the end of you, and the end to my cursed past. ^ Sega Studio USA. Shadow the Hedgehog. Shadow: Only one thing left to do... To put the past behind me! Chaos ... Control! ^ Sega Studio USA. Shadow the Hedgehog. Tails: YEAH...he did it! The Black Comet is destroyed! / Sonic: Shadow...that was SWEET! / Rouge: I hope he's OK. / Amy: I'm sure he's fine, Rouge. After all, he is Shadow! / Eggman: How about giving me back those Chaos Emeralds now? / Knuckles: Hey, get back here you creep! ^ Sega Studio USA. Shadow the Hedgehog. President: How ironic... After the way we all treated him, he saved us all in the end. We were all wrong about the professor. ... Let us pay homage to Professor Gerald! Let's work to ensure peace and prosperity for a brighter future! What do you say, Commander? / Commander: Excellent idea, Mr. President. ^ Sega Studio USA. Shadow the Hedgehog. Shadow: Goodbye forever... Shadow the Hedgehog. ^ a b Klepek, Patrick (May 24, 2005). "Shadow the Hedgehog Preview from 1UP.com". 1UP.com. Ziff Davis. Archived from the original on November 8, 2012. Retrieved February 9, 2009. ^ Leone, Matt (8 March 2005). "Sega Reveals Sonic Adventure 3". 1UP.com. Archived from the original on 26 April 2006. Retrieved 28 January 2009. ^ a b Kemps, Heidi (September 30, 2005). "Sega's Yuji Naka Talks!". GameSpy. Retrieved December 30, 2009. ^ "Sonic the Hedgehog". Di-O-Matic.com. Archived from the original on 8 April 2016. ^ Sega Studio USA. Shadow the Hedgehog. Shadow: Where's that damn fourth Chaos Emerald? ^ Sega Studio USA. Shadow the Hedgehog. Shadow: Yes, doctor, you will regret ever having created me. You're going straight to hell! ^ Sega Studio USA. Shadow the Hedgehog. G.U.N. Commander: The black creatures will feel their own bloody hell! ^ Sega Studio USA. Shadow the Hedgehog. Knuckles: Damn! A dead end! ^ Sega Studio USA. Shadow the Hedgehog. Sonic: Damn, they got away! Leave it to me, I'll chase them down! ^ ""セガモバ"で『シャドウ・ザ・ヘッジホッグ』のサントラCDがプレゼント！". Famitsu (in Japanese). Retrieved May 5, 2009. ^ "Amazon.com - Shadow the Hedgehog: The Official Soundtrack". Amazon.com. Retrieved April 28, 2013. ^ Joscelyne, Svend (September 12, 2005). "Sonic Voiceover Cast Replaced". The Sonic Stadium. Retrieved November 17, 2014. ^ Madden, Orla. "Ninterview: Meet Roger Craig Smith – Voice Actor for Sonic the Hedgehog / Chris Redfield". Nintendo Life. Gamer Network. Archived from the original on September 23, 2017. Retrieved March 19, 2019. ^ a b "Shadow the Hedgehog for GameCube Reviews, Ratings, Credits, and More at Metacritic". Retrieved 2012-11-18. ^ a b "Shadow the Hedgehog for Xbox Reviews, Ratings, Credits, and More at Metacritic". Retrieved 2012-11-18. ^ a b "Shadow the Hedgehog for PlayStation 2 Reviews, Ratings, Credits, and More at Metacritic". Retrieved 2012-11-18. ^ a b c Bettenhausen, Shane (November 23, 2005). "Reviews: Shadow the Hedgehog for GameCube". 1UP.com. Archived from the original on 15 November 2014. Retrieved January 26, 2009. ^ a b c Bramwell, Tom (November 15, 2005). "Shadow the Hedgehog Review". Eurogamer. Retrieved March 27, 2009. ^ a b c d e f Helgeson, Matt (January 2006). "Shadow the Hedgehog for GameCube Review". Game Informer. Archived from the original on 26 May 2006. Retrieved March 27, 2009. ^ a b c d e Klepek, Patrick (November 16, 2005). "GameSpy: Shadow the Hedgehog Review". GameSpy. Retrieved March 27, 2009. ^ a b c Casamassina, Matt (November 17, 2005). "IGN: Shadow the Hedgehog Review for GameCube". IGN. Retrieved January 28, 2009. ^ Casamassina, Matt (November 17, 2005). "Shadow the Hedgehog Review for PS2". IGN. Retrieved January 26, 2009. ^ a b c d e f g Thomason, Steve (January 2006). Nintendo Power. No. 199. p. 111. Missing or empty |title= (help) In Nintendo Power's final issue in December 2012, Thomason recanted his 8.0 score, stating, "I was young, stupid, and had an inexplicable weakness for any game starring hedgehogs. I apologize profusely to anyone who bought that abomination on account of my misguided praise." See Thomason, Steve (December 2012). "Power Players: Nintendo Power editors past and present recall their favorite memories of the magazine". Nintendo Power. No. 285. p. 11. ^ a b c d e "Xbox Review: Shadow the Hedgehog". Official Xbox Magazine. December 6, 2005. Retrieved March 27, 2009. ^ a b c d "Reviews: Shadow the Hedgehog". X-Play. Retrieved March 27, 2009. ^ a b "Shadow The Hedgehog". The Times. January 7, 2006. p. 14. ^ "Shadow the Hedgehog (Xbox) reviews at". GameRankings. Retrieved 2012-11-18. ^ "Jetix Magazine Reader Awards 2006". Official Jetix Magazine. No. 26. Future plc. August 4, 2006. ^ "2005 Nintendo Power Awards". Nintendo Power. Vol. 19 no. 203. May 2006. p. 56. ^ "Sega Sammy Holdings Annual Report 2006" (PDF). July 2006. p. 47. Retrieved 2017-11-27. ^ "Fiscal Year Ended March 2007 Full Year Results" (PDF). 2007-05-14. p. 15. Retrieved 2017-11-27. ^ "Shadow the Hedgehog for PlayStation 2 - Shadow the Hedgehog PlayStation 2 Game - Shadow the Hedgehog Game". GameSpot. Archived from the original on 11 September 2011. Retrieved September 17, 2010. ^ "Shadow the Hedgehog for GameCube - Shadow the Hedgehog GameCube Game - Shadow the Hedgehog Game". GameSpot. Archived from the original on 19 June 2009. Retrieved February 8, 2009.